UPDATE -4/11/19: Watch the recording of the full webinar! While prison populations have declined in recent years, they remain enormous, and immigration detention has ballooned. Also, in many areas where prison populations have decreased the most, racial disparities have worsened. Webinar faculty will talk about how to seize opportunities to close facilities in ways that don’t lead to new ones opening, eliminate criminal laws in ways that don’t just help the privileged, and get people out in ways that don’t demonize those still inside. 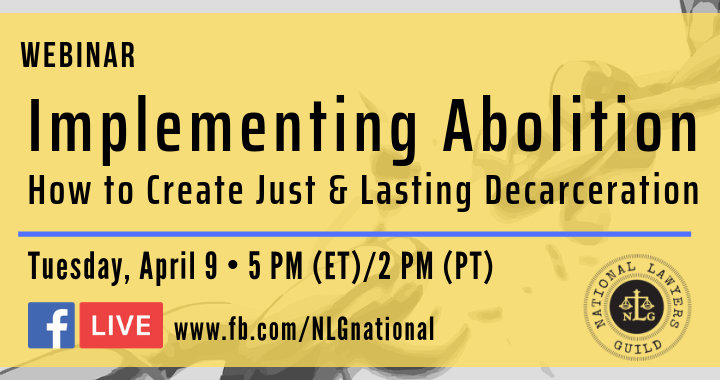 Together, we will share strategies for accelerating decarceration and building just and lasting change. Pooja Gehi (moderator) is the Executive Director of the National Lawyers Guild. Pooja graduated from American University’s Washington College (WCL) of Law in 2004 with a JD/MA in international affairs. At WCL she was the board chair of her National Lawyers Guild Law School Chapter.For the past eight years, Pooja has worked as a staff attorney and then the Director of Immigrant Justice at the Sylvia Rivera Law Project (SRLP) where she provided direct legal services for hundreds of low-income transgender and gender nonconforming clients in administrative hearings, immigration proceedings, civil litigation, and prisoners’ rights cases. Throughout this experience, she collaborated closely with LGBT organizations to build an analysis of gender justice among poverty and queer advocates across the nation. Pooja litigated Cruz v. Zucker, securing access to transition related healthcare for New York State Medicaid recipients. Rev. Jason Lydon is a Unitarian Universlist minister. In 2005, after his own incarceration, Jason founded Black and Pink, a nationally networked grassroots organization working to abolish the prison industrial complex while meeting the immediate needs of LGBTQ/HIV+ prisoners. Jason served as the National Director of Black and Pink until 2017. Jason has focused most of his abolitionist organizing with an attention to the needs of survivors of sexual violence in prison. Now, as a recent transplant to Chicago, Jason works with faith based and secular abolitionist efforts including the Chicago Community Bond Fund and the Unitarian Universalist Prison Ministry of Illinois. Oren Nimni is a Staff Attorney at the Lawyers’ Committee for Civil Rights where he manages their immigrants’ rights and criminal justice docket. His legal practice focuses on cutting-edge constitutional litigation on behalf of people of color and immigrants. He is currently litigating the first lawsuit filed in the country against the Trump Administration to save Temporary Protected Status on behalf of Haitian, Honduran, and Salvadoran immigrants. He is also litigating the first lawsuit filed in the country to block federal officials from conducting immigration arrests in state courthouses. His work in these groundbreaking cases has received significant national attention. Oren employs a community lawyering model. He is deeply embedded in the community, and regularly advises grassroots organizations on policy and legal matters. Prior to joining the organization, Oren was a partner at the Community Law Office, a Boston-based firm. At the Community Law Office, Oren provided holistic representation to low-income clients and community organizations in criminal and civil matters. He also served as a Steering Committee member of Law for Black Lives. Oren also teaches courses on Law and Social Movements at Suffolk University Law School and serves as legal editor for the popular political magazine Current Affairs. He is a graduate of Brandeis University and Northeastern University School of Law. Dean Spade is an associate professor at the Seattle University School of Law. In 2002, he founded the Sylvia Rivera Law Project, a non-profit collective that provides free legal help to low-income people and people of color who are trans, intersex and/or gender non-conforming and works to build trans resistance rooted in racial and economic justice. He is the author of Normal Life: Administrative Violence, Critical Trans Politics and the Limits of Law (Duke University Press 2015). His video projects and writing are available at deanspade.net. Azadeh Shahshahani is the Legal & Advocacy Director at Project South. Azadeh has worked for a number of years in the South to protect the human rights of immigrants and Muslim, Middle Eastern, and South Asian communities. She previously served as National Security/Immigrants’ Rights Project Director with the ACLU of Georgia. Azadeh is a past president of the National Lawyers Guild. Azadeh also serves as Chair of Georgia Detention Watch, Co-chair of the US Human Rights Network Working Group on National Security, and on the Advisory Council of the American Association of Jurists. She has also participated in international fact-finding delegations to post-revolutionary Tunisia and Egypt as well as a delegation focused on the situation of Palestinian political prisoners. She is the author or editor of several human rights reports, including a 2017 report titled “Imprisoned Justice: Inside Two Georgia Immigrant Detention Centers,” as well as law review articles and book chapters focused on racial profiling, immigrants’ rights, and surveillance of Muslim-Americans. Her work has appeared in the Guardian, the Nation, MSNBC, USA Today, Aljazeera, and the Huffington Post, among others. Azadeh received her JD from the University of Michigan Law School where she was Article Editor for The Michigan Journal of International Law. She also has a Master’s in Modern Middle Eastern and North African Studies from the University of Michigan. Panagioti Tsolkas is a founding member of Fight Toxic Prisons (FTP), a grassroots activist collective working at the intersection of environmental justice and prison abolition. He organizes with the Incarcerated Workers Organizing Committee (IWOC), contributes writing and research regularly to Prison Legal News and is a coordinator of Nation Inside, an online action platform. Panagioti is also a former editor for the Earth First! Journal, co-founder of the Earth First! Prisoner Support Project and lifelong practitioner of civil disobedience, which has resulted in dozens of direct encounters with the criminal justice system. He was named “Troublemaker of the Year” and “Best Political Activist” by the New Times (Palm Beach/Broward). He served as chairperson for the City of Lake Worth’s Community Relations Board (tasked primarily with oversight of police conduct), as co-chair of the Palm Beach County Environmental Coalition, and as an executive committee member of the Sierra Club’s Loxahatchee Group. He also currently works part time on a small farm in North Florida and is a co-parent of two small children. Carl Williams is a movement lawyer, organizer and scholar-activist dedicated to creating the conditions where people are free from all systems of oppression. Carl has practiced criminal and civil rights law in Massachusetts for over twelve years. He began his legal career as a criminal defense attorney with the Committee for Public Counsel Services, recently served as a racial justice attorney with the ACLU of Massachusetts. A long-time resident of Boston’s Roxbury neighborhood, Carl is an activist, organizer and public advocate on issues of war, immigrants’ rights, LGBTQ rights, and for Black and Palestinian liberation. He is member of the National Lawyers Guild, and currently serves as co-chair of its Massachusetts Board of Directors. Carl was part of the legal defense for the the Occupy Boston movement, providing legal, bail, and court support and training to the thousands of participant-organizers. In 2015, he served on the working group that organized the inaugural Law for Black Lives convening, and was a featured speaker in its RadTalks event. Carl was a Givelber Distinguished Lecturer on Public Interest Law at Northeastern University School of Law, where he taught on social justice movements and the law. As of the fall of 2018, Carl is a practitioner-in-residence at Cornell Law teaching a course on the history and theory of movement lawyering. Carl is a graduate of the University of Rhode Island and the University of Wisconsin Law School. Carl tweets at @carltonwilliams. Posted in Announcements and tagged Mass Incarceration, Prison Abolition, Prisons, Webinars.